Breaking down silos between our work is hard to do. This is not surprising when the strategy to get things done is often captured by the phrase, “Divide and conquer!” No wonder we get stuck sometimes and find it difficult to build new ways of working together. One technique we use to support groups is to collect information and transform it visually for the group to see. 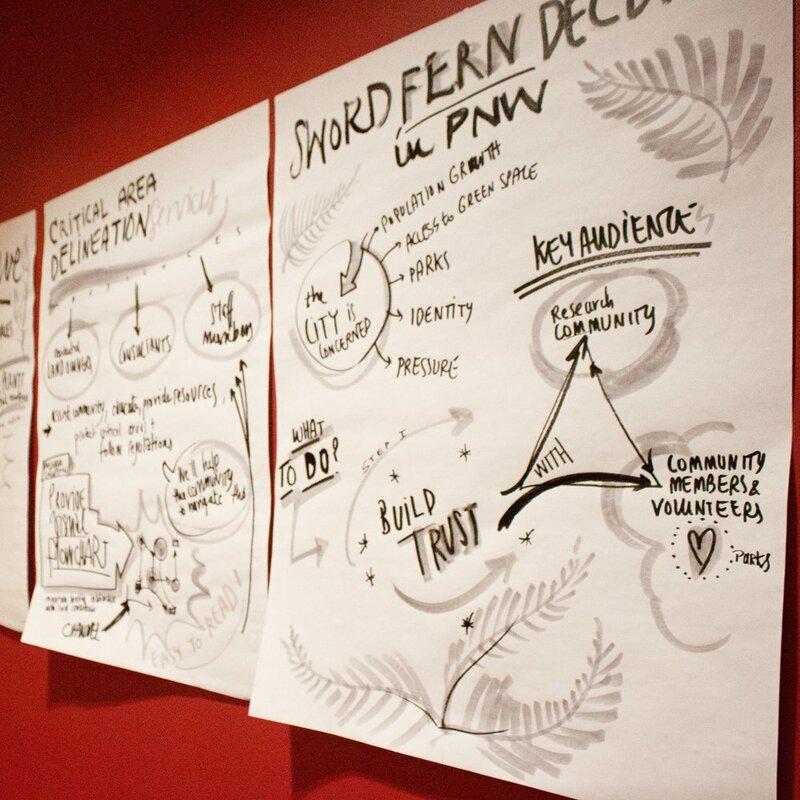 This graphic strategy is sometimes called “graphic note-taking”, “graphic facilitation”, or our favorite: “graphic harvesting”. Essentially, in a group setting we gather ideas from participants, weave the ideas together graphically and present the ideas in an easy-to understand format. 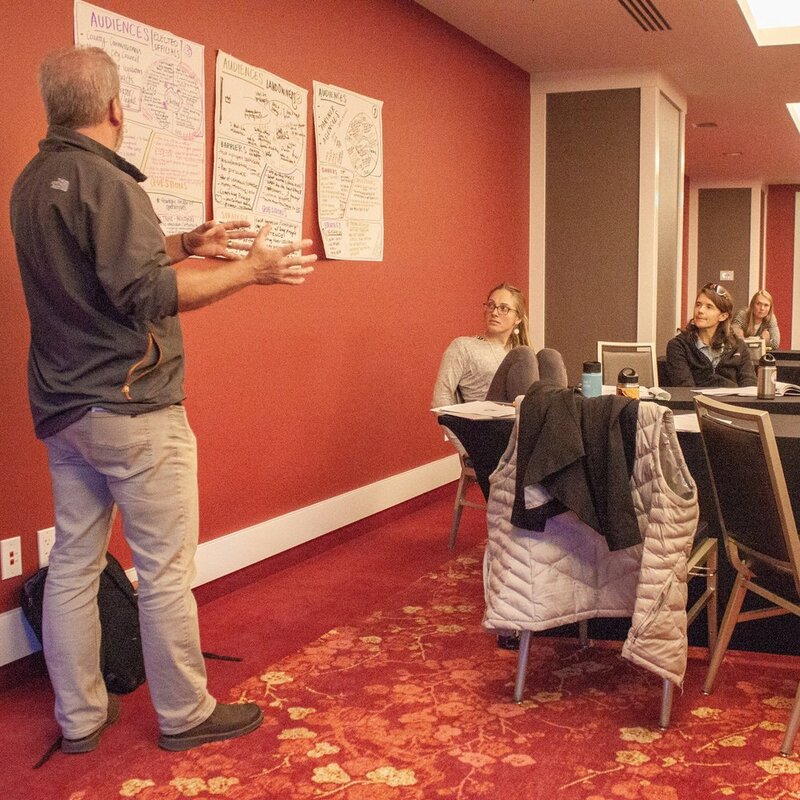 Society for Ecological Restoration and Society for Wetland Scientists’ conference attendees answer the question “What makes a restoration project resilient?” The harvest board was a common place for conversation, thinking out loud with colleagues, and drawing connections between ideas. Graphic strategies can be used in a variety of contexts to gather ideas, thoughts or research into one space. Visualization is a powerful tool to transform conversation and solutions. It is the role of the designer to capture and highlight threads that weave the work together. 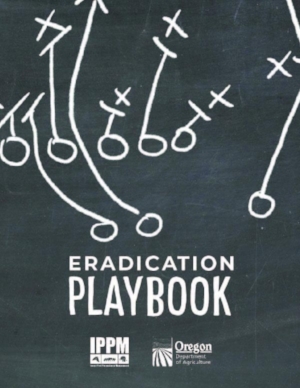 As visual thinkers, creatives, and idea facilitators, we use various tools of our trade -- symbols, icons, empathy, and intuition -- to translate complex data into visual information that can be more easily understood. The results are profound. Often, the space in front of a harvest mural is a place for discussion. Colleagues, students, and event staff stop to chat about the complexities between projects, overlapping ideas, gaps, and underlying themes. The colors, imagery and design of a harvest prompts participants to use their creativity, intuition, memory, and emotion alongside their intellect. This dynamic activity inspires both individual and group thinking and helps to create new connections in a creative and innovative space. When can you use graphic strategies to support collaboration? There are endless options! 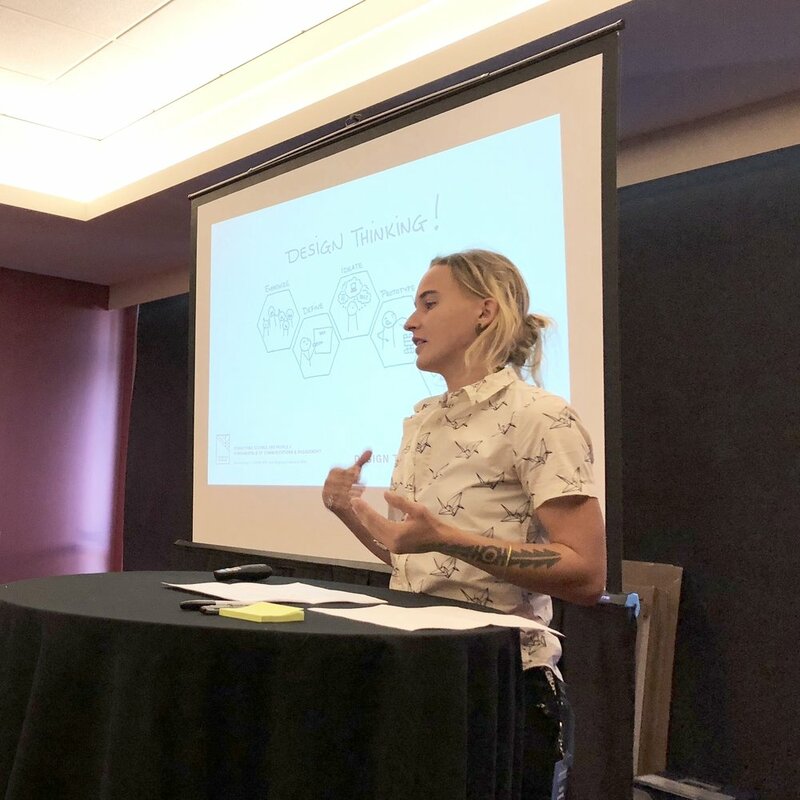 Conferences: Ask a key question of conference attendees to gather insights into what attendees are working on or how they view solutions to a problem. Draw a harvest mural each day and post for a social event. Meetings: Highlight key points as graphic meeting notes and post for a quick-reference artifact from the meeting. Workshops: Gather information from small-group breakout sessions and harvest the results or follow up discussion for the full group. Traveling for the Holidays? Don't Pack a Pest! ‘Tis the season for lots of holiday traveling and opportunities for plant and animal pests to hitch a ride on the things you bring with you. If you’ve traveled internationally, you are probably familiar with the Customs process, filling out a Declaration form and talking to a U.S. Customs and Border Protection official. They want to find out what you’re packing from your travels that could–intentionally or unintentionally–be bringing pests. What exactly are they looking for and what’s the real risk? One example of the risk - only a couple millimeters in length and much smaller than your common house fly, certain fruit flies’ eggs and larvae can easily hide unseen inside fruits and vegetables. Working with the federal-state cooperative educational program “Don’t Pack a Pest”, Samara Group was contracted to develop materials to educate travelers about the risks associated with carrying certain types of food, plants, or other agricultural items in passenger baggage. A key product from this work was a brochure, known as the Travelers Guidelines. Our design solutions were informed by an evolving program brand that is used by various state and federal agencies. We stepped into the role to implement new design solutions based on a survey of hundreds of University students conducted by Oregon Sea Grant in 2017. The brochure has a reach of more than 8,000 copies distributed to travelers around the country. The goal of this brochure is to communicate concepts that are not always explicit such as: What does it mean to declare? Why are the agricultural items in my suitcase a risk to the country that I’m traveling to? Next time you travel, Remember: Don’t Pack a Pest and Always Declare all Food, Plants, and Agricultural Items. Use the U.S. Customs Declaration Form to declare all food, plant, and agricultural items. Visit www.oregoninvasivespeciescouncil.org/dont-pack-a-pest to view the guidelines online. Samara Group recently became certified as a Women Business Enterprise and Emerging Small Business (WBE / ESB #10398) through Oregon’s Certification Office for Business Inclusion and Diversity (COBID). We are excited to be recognized through this program that helps small businesses succeed by leveling the playing field for certified firms. You can now find us in COBID’s online directory of certified firms by name, certification type, business description, or by specific commodity codes. Did you know that Samara Group is also Silver Certified through the City of Portland’s Sustainability at Work program? This program offers three levels of certification (certified, silver, and gold) to recognize your business’s positive impact on our environment and our community. 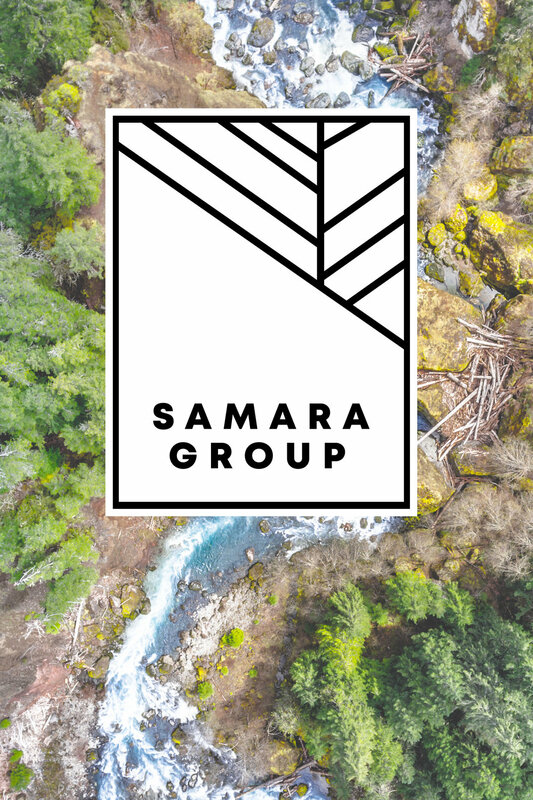 This certification and associated services allows Samara Group to recognize and expand sustainable office efforts including recycling and reuse of materials. Currently, Samara Group staff are working towards improvement of personal and building practices to advance to Gold certification. Through our company policies and culture, we are continually looking for ways to enhance everything from sustainable practices to equity leadership and promoting ongoing learning applied to diversity, equity, and inclusion. We are deeply committed to doing the right thing for the environment and supporting our staff and community to the fullest. Samara has a new, updated look! When Samara Group was founded in 2015, the vision of a samara in the company name was symbolic: with science at the core (the seed), communication and partnerships are the wings to make it fly! Since then, we have have grown to provide a range of high-quality services—and recently updated our brand to grow with us. In 2018, we took a step back to look at all that we provide for our clients. We remain committed to science at our core. We specialize in layering in strategy and design to connect science and people. And, we embody collaboration, communication, diversity and connections in everything we do! This river ecosystem is one depiction of the beauty of complexity. The organic shapes of the rushing river and surrounding area compare and contrast with our simple, modern logo. Beyond the logo, we wanted to highlight the unique nature of our work: environmental consulting that blends Science, Strategy, and Design. We are quite different from other consulting firms, in a good way. These overlapping elements are a unique combination of skill sets that have proven invaluable to our clients. We work side-by-side with our clients to create solutions to complex problems. Each project is unique. We can work with you to custom-tailor a solution to fit the needs of your project. Last Friday’s Open House event was a success! Over 60 people from 30+ organizations, agencies, and businesses joined us at our new building to share stories, catch up with colleagues, eat amazing food, make new connections, and enjoy the afternoon! We had our portfolio on display, shared photos from our staff field visits over the past year, and also had an interactive corner where attendees could submit an answer to our question and one of our graphic facilitators drew their responses on the wall. It was exciting to watch it fill up over the course of the evening! What Change do you want to see for the future of Oregon? Katelyn Hale, one of Samara’s graphic facilitators displays a participant’s answer to the question at one of our two interactive stations. A snapshot of what we do We work closely with our client teams to develop a successful project and showcase the work with professional photography! Our buddies at Sugar Street did an excellent job keeping tasty treats abundant and drinks flowing, capping the night off with some amazing gluten-free cupcakes! Lots of catching up with colleagues, past and present. Thank you Sugar Street for all of the amazing food! We were excited to host our community for a few reasons. First, we wanted to introduce colleagues to what we do and our new location. 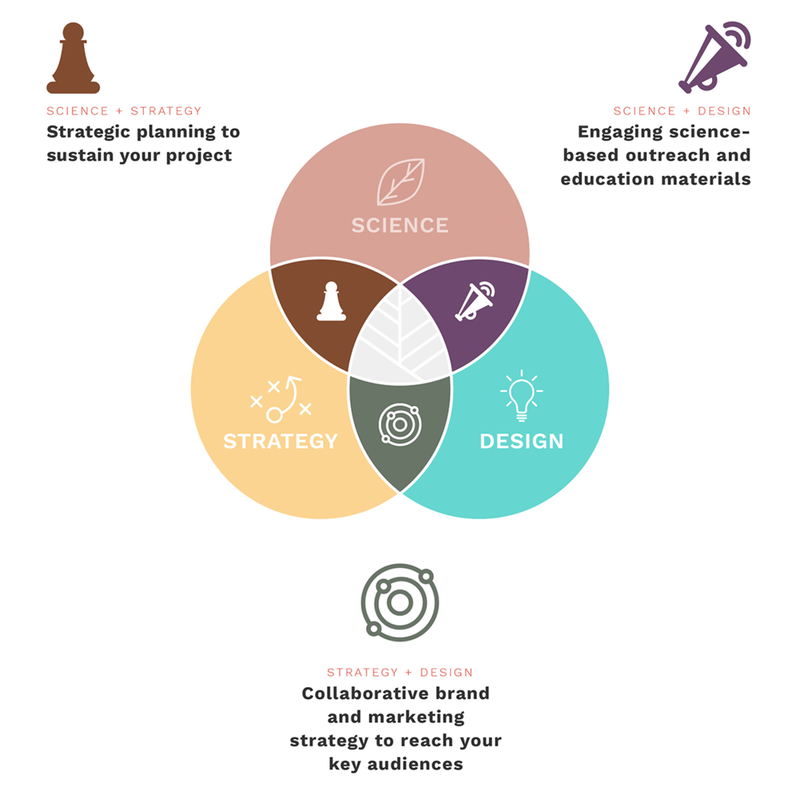 We have a diverse team of professionals spanning facilitation, research, web design, and communication (just to name a few) to provide exceptional science, design, and strategy services. Nestled next to the Hawthorne Bridge, we have a dynamic view of the bridge and the West Hills beyond. It’s a great location for our bike commuting staff members, and for those who drive, it’s easy to monitor traffic, ha! And most exciting of all: we unveiled our new branding! 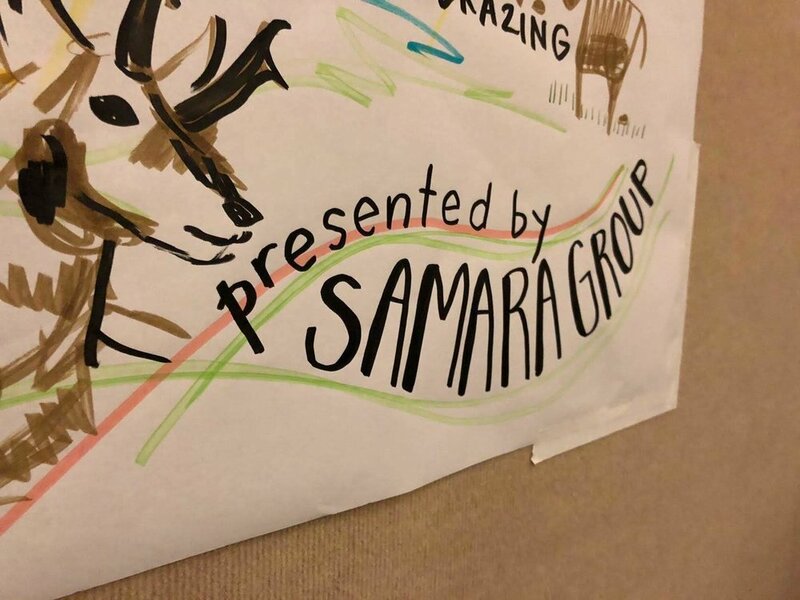 New logo and brand for Samara Group. Our team. We almost got the whole Samara Team! Not pictured: Robyn, James, and Sandra. We want to give a big THANK YOU! To all the attendees, clients, colleagues, advocates, supporters, friends, and family who turned out on Friday. We’re happy you came by!